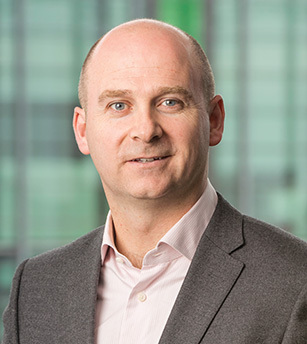 Stephen Wheeler is Managing Director of Ireland’s second-largest energy utility SSE Ireland, part of the FTSE-listed SSE plc. Stephen has responsibility for overall strategy, commercial performance and business development for SSE’s business in Ireland. Prior to this, Stephen was Managing Director of SSE’s retail brand SSE Airtricity and previously General Manager for Ireland of SSE Renewables with responsibility for SSE’s development and construction activities. Stephen came to SSE with significant international experience after working with ABB and Siemens, specialising in the development and construction of thermal power generation projects. A graduate of electrical engineering from University College Dublin with an MBA from the UCD Michael Smurfit Graduate Business School, Stephen is a past Chairman of the Irish Wind Energy Association (IWEA).